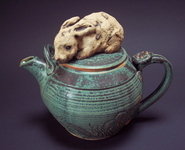 Pottery and clay sculpture. Animals, fish and insects are frequent themes. Studio and gallery in the woods. Please phone for directions.